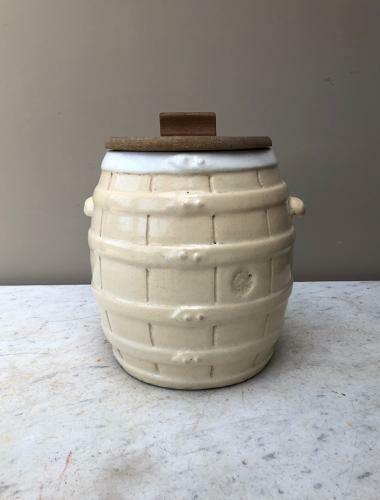 Sold to me as a Victorian Butter Pot....& it could have been used for that in all honesty but these ceramic barrels were made in varying sizes as Victorian Butchers Pickling Pots and Ox Tongues were pickled & stored for sale inside them in the Butchers Shop. (A much loved delicacy then). This barrel is in such good condition...the white ceramic interior looks unused..there is no damage and there are no hairlines (which they nearly always have) and it is a rare small size and perfect standing on a worktop for many uses.